New Delhi: When Prime Minister Narendra Modi announced the invalidation of 86% of currency notes on 8 November 2016, only a small group of carefully chosen bureaucrats were in the loop. Economic affairs secretary Shaktikanta Das was the top bureaucrat in the finance ministry who was leading the secret mission and ultimately became the government’s face explaining and clarifying the myriad confusions that followed. Das had to face the brickbats and harsh questions from the media amid policy flip-flops, and on the sheer lack of preparedness. However, a media-savvy and mild-mannered Das took all of it in his stride. Several weeks after demonetization, when Das was quizzed about the eerie silence of then governor Urjit Patel, he said: “It is not relevant who speaks. I am speaking on behalf of the government, I am not speaking here in my individual capacity. So, therefore, it is irrelevant whether I am speaking or somebody else is speaking." “Let’s not do these things...For communication purposes, it is irrelevant who addresses. The idea is government should communicate and give out all the information," Das retorted. With the appointment of Das as the new governor of the Reserve Bank of India (RBI), the top position at the central bank returns to a career bureaucrat after a gap of five years when D. Subbarao demitted office in 2013. Das was one of the contenders for the position in 2016 when the government decided not to give an extension to Raghuram Rajan, but missed out to Rajan’s then deputy Urjit Patel. His name was also considered for the chairman of the Securities and Exchange Board of India (Sebi) but Bharatiya Janata Party (BJP) leader Subramanian Swamy’s open tirade against Das, terming him Congress leader “P. Chidambaram’s man" forced the government not to choose him for the post, despite Jaitley publicly defending his credentials. He had earlier narrowly missed out on holding the rather ornamental finance secretary position despite serving a long time in the finance ministry as the government appointed his batchmate Ashok Lavasa as expenditure secretary. Though Das was eight months senior to Lavasa in age, Lavasa got the coveted position as he had secured a higher rank in the civil service merit list. Das, a 1980 officer of the Indian Administrative Service from Odisha, belongs to the Tamil Nadu cadre and successfully led the industrialization of the state as its industry secretary. His proficiency in Tamil meant he would often take questions from local media in Tamil and reply in the same language to the amusement of finance minister Jaitley and the rest of the media fraternity. Das once explained that as a young IAS officer in his cadre state, he would often go to watch Tamil movies with a local assistant to get a hang of the language which helped him learn it quickly. 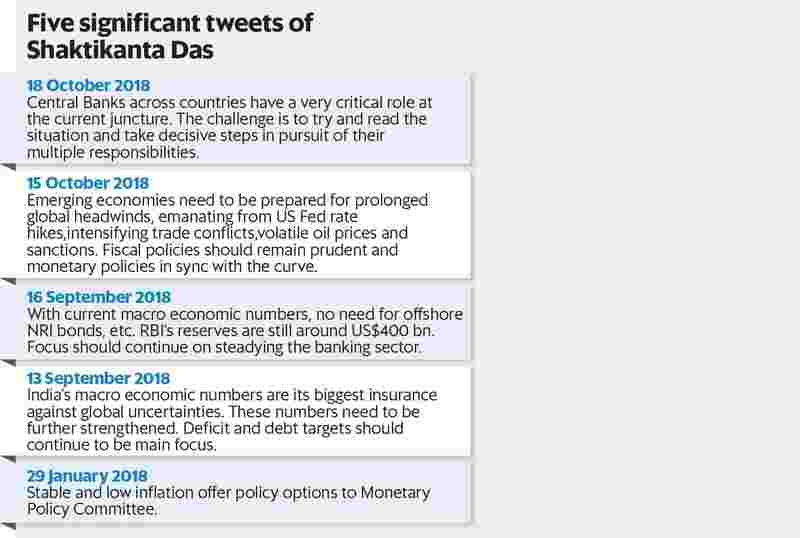 After he demitted office last year, Das was appointed member of the 15th Finance Commission as well as India’s Sherpa for the G20 after retirement. Das is a fiscal conservative and as a governor, is likely to keep a hawk eye on government’s fiscal management in an election year. As the economic affairs secretary in the finance ministry when there was pressure from within and outside on the government to loosen purse strings for the 2016-17 budget, Das prevailed upon finance minister Jaitley to stick to the fiscal consolidation road-map, fearing a market backlash. Though Das is considered very close to Jaitley and pushed for higher dividends from RBI during his tenure at the finance ministry, things could change as it has often in the past with bureaucrats changing colour when they shift address from North Block to the Mint Street.